Home › Company › Product News › New small-footprint Milling Machine improves decapsulation workflows, offers LASER-like results at 10% of the investment. 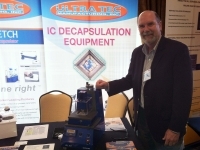 December 17, 2012– ULTRA TEC Manufacturing, Inc. (Santa Ana, CA) announces the availability of a new product for the global Electronic Failure Analysis and Counterfeit Prevention Communities. Blue Mill Pre-Cavitation and Gasket Milling System addresses several key challenges that limit the usefulness of chemical decapsulation (acid) systems, by quickly and effectively pre-cavitating ‘difficult’ mold compounds and other electronic packaging materials. Blue Mill is a small footprint (only 10 inches wide) milling machine that has analog controls for setting X-Y table amplitude, and a 5-micron accuracy Z-Axis, with digital readout. A rapid pre-cavitation process, often as short as 2-3 minutes, yields a sample with extremely straight etch-walls, ready for final decapsulation with a Chemical Decapsulator, such as ULTRA TEC’s own RAPIDETCH Dual Acid system, or a plasma-based (dry decapsulation) machine. Other applications of Blue Mill include the manufacture of standard fluoro-elastomer gaskets used in chemical decapsulation machines, and the machining of workholders and fixtures for decapsulation and polishing. Priced in the low US$10K range, the unit offers a very fast return on investment, both in the increased overall speed of decapsulation processes, and in lower acid and chemical usage. Blue Mill units are available now for demonstration, with initial production quantities shipping in Q1, 2013.